As promised, Blizzard has opened up pre-orders for its next World of Warcraft expansion, Cataclysm, on Battle.net. Buy World of Warcraft: Cataclysm now, download it before launch date, then play one minute after the add-on officially launches. Of course, you won't get that lovely box art, but you'll be playing it immediately. Digital upgrades for WoW are now available online and will unlock at 12:01 am PST on December 7, the official launch day of World of Warcraft: Cataclysm. Blizzard has also put together a little FAQ about the digital upgrade process, Collector's Edition confusion, and more. Q. When will my credit card (or other payment method) be charged? A. You will be charged on the day that you place your pre-order for World of Warcraft: Cataclysm. Q. Why do I need to log in to the game once after I've upgraded? A. The first time you log in after pre-ordering, your account will become eligible to begin receiving the Cataclysm data when it's available. The data will automatically download in the background while you play World of Warcraft or while you have the Launcher window open. Q. Can I pre-order a physical copy of Cataclysm and have it shipped? A. Not from Blizzard Entertainment, but many retailers offer pre-orders of physical boxes and Collector's Editions. Q. In what regions is the Cataclysm pre-sale available? What day/time is Cataclysm launching in my region? Q. Will a digital version of the Collector's Edition, with the exclusive pet, be available? A. No. 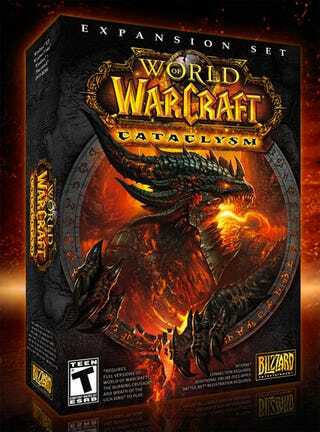 The World of Warcraft: Cataclysm Collector's Edition is exclusive to physical retail copies. The digital version consists of the standard edition.